McGuire has averaged 6.3 boards and over a block per game as a starter, but does so much more. It was the late '90s and a young Ben Wallace was exciting D.C. basketball fans with rebounding and defense (of all things). So what does Wes Unseld do? He trades Wallace for a chubby non-rebounder who could barely jump over a piece of paper -- ladies and gentlemen, Ike Austin! Can you appreciate GM Ernie Grunfeld over the ineptitude of Wes Unseld now? Either big Wes didn't learn from the trials of John "Hot Plate" Williams and the late Kevin Duckworth, or he has several soft spots for the rotund. Austin, (who, OMG!, won the "coveted" NBA Most Improved Player award in '96-'97) was coming off a disappointing first season of a three-year, $15 million contract in Orlando. He was sold as a sorely needed scoring big man, but continued to fizzle in Washington until he was traded to the Vancouver Grizzles during the Michael Jordan administration. We don't need a New York Times Michael Lewis article to tell us that role players are valuable. Check championship rosters, they're always a key ingredient. 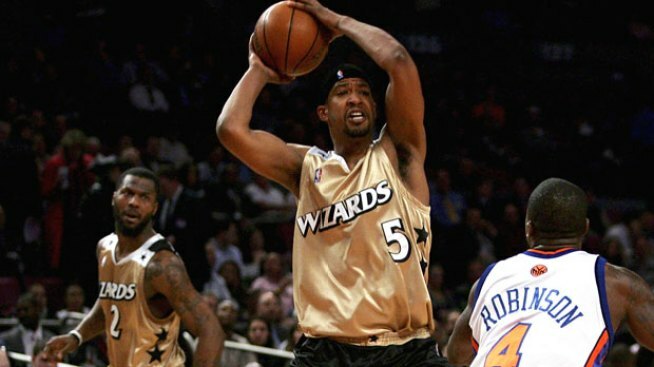 Bruce Bowen, one to whom Dominic McGuire has been compared, is on the downside of a three-ring career with the Spurs. The Wizards have long needed someone like Ben Wallace in his four-time NBA Defensive POY heyday. McGuire has the potential to be that valuable of a commodity. This makes him untouchable now, not later. The one they call "Taser" plays the brand of defensive, dirty-work basketball even casual basketball fans can appreciate. He's shown development in his jumper and passing skills, but obviously needs continued work in those areas. Refined decision making will come when veteran status is earned. Don't expect Dom to ever put on a dribbling clinic, but that's OK. The most important aspect is that McGuire already knows and embraces his role. If the franchise plays its cards right, he'll be playing the part for years to come.